Click on the above image to see a Flash animation. I modeled figure above in Blender, exported to ActionScript 3 using Dennis Ippel's Python script, and then rendered it in Flash using Sandy. It was coded using FlashDevelop. All done with open source! When it loads, click Auto Refresh. I had to move my Background Image window to get it to show the loaded movie. 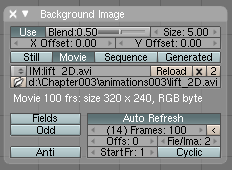 Clicking Auto Refresh is important as that advances the movie when you advance frames in Blender's Timeline.